National Reining Horse Association (NRHA) Hall of Fame stallion, “Gunner” (Colonels Smoking Gun), is unofficially the eighth NRHA Two Million Dollar Sire. His offspring have quickly racked up earnings moving him from the list of 18 Million Dollar Sires up to the Two Million Dollar achievement in just three years. Money earners at the 2010 NRHA European Futurity (Pretty Miss Smokegun and Gunspinner) and at the Cactus Reining Classic (Gunners Special Nite) helped bring his unofficial total progeny earnings to $2,000,453. 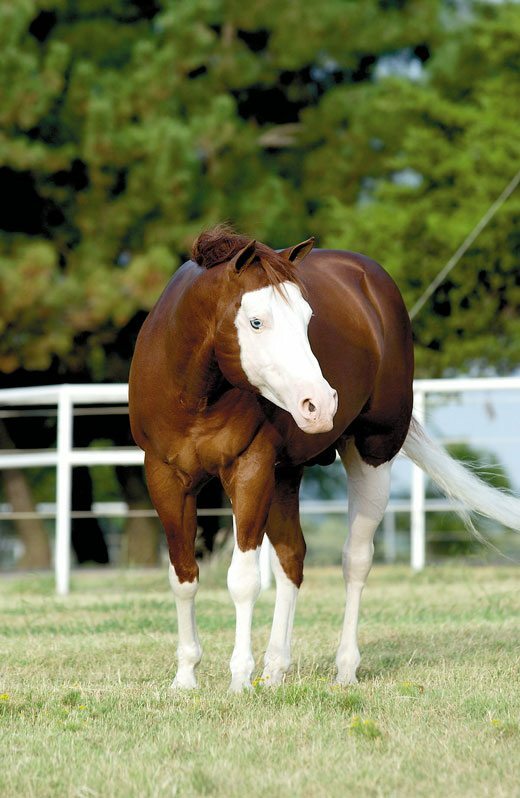 Gunner, bred by Eric Storey, is the top earning offspring of the Colonel Freckles’ son Colonelfourfreckle. The 1993 stallion is out of Katie Gun who has produced NRHA earners of more than $405,000. Gunner was the 1996 NRHA Futurity Open Reserve Champion ridden by Clint Haverty. At the time, Paul and Pam Rohus/Double PR Ranch owned Gunner. Five years later, he won the USEF National Reining Championship with Bryant Pace aboard for owner Debra Sloan. The stallion earned nearly $175,000 in his career and was inducted into the NRHA Hall of Fame in 2003. McQuay Stables Inc.’s (Tim and Colleen McQuay) currently own and stand the stallion in Tioga, Texas. Gunner’s top performers include: Gunners Special Nite ($163,100: two-time NRHA Derby Level 4 Open finalist, NRHA Futurity Level 4 Open Reserve Champion, NRHA Futurity Level 3 Open Champion, NRBC Level 4 Open finalist and AQHA World Show Junior Reining finalist); Gunnatrashya ($157,390: NRHA Futurity Level 4 Open Champion and All American Quarter Horse Congress Open Champion), The Great Guntini ($130,590: finalist in NRHA Futurity Open Level 4, NRBC Open Level 4 and NRHA Derby Open Level 4); Snow Gun ($122,090: NRHA Futurity Open Level 4 third place, WEG Team Silver Medalist, and NRBC Level 4 Open finalist); Sorcerers Apprentice ($90,540: AQHA World Champion Senior Reining; and finalist in NRHA Futurity Level 4 Open, Reining By The Bay Level 4 Open and NRBC Level 4 Open). NRHA will recognize Gunner for this spectacular achievement during the 2010 NRHA Futurity & Adequan® North American Affiliate Championship Show in November. He also will be recognized during the National Reining Breeders Classic in Katy, Texas. Incorporated in 1966, the National Reining Horse Association is the governing body of the sport of Reining. NRHA, with their International Headquarters in Oklahoma City, is responsible for promoting the sport of Reining and working to ensure the highest standards of competition. To learn more about the NRHA, its programs and family of corporate partners, visit nrha.com. hey,just identified your Post when i google something and wonder what webhosting do you use for your web site,the speed is more faster than my blog, i really want to know it.will back to check it out,many thanks! Great post. Thanx for the good information.I hope you have a great day!